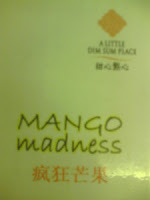 Read an advert on newspaper bout this restaurant, they r promoting mango tang yuen 芒果汤圆. it's an copied idea from a hk series "ahwong" 阿旺新传. i m curious how the heck mango can b cooked in this chinese traditional syrup soup, so mah giv it a try loh... they got a menu specially for mango craze i.e. mango pancake, mango tangyuen, mango watever. n as the shop name suggests, they serve dim sum, u can read more here. i m not goin to promote in long paragraph 'cos i hv only 1 word for the restaurant - lousy! lousy in food, lousy in cust svc, lousy in their job distribution, lousy in payment sys etc etc. i ordered 2 mango tangyuen, a pancake, n 1 o 2 dim sum. waited for 30 min w/o giving fuss to them. no one approached me n tell me tat it's out of stock till i the asked a waitress. ok fine, then i mah checked the bill planning to go to the next door 记得食 saimai lou, suddenly i saw my next table who came in much much later than me got 2 mango tangyuen!! LLM, TNS, i mah challenged the waitress y. hehehe... may b i looked like a killer tat time, she wen to the next table n told the couple wrong table, then get that 2 bowls for me (still untouched la). i dunno wan to laugh or angry tat time... i returned one bowl to the couple, tasted the worst tangyuen i ever got in my life, paid, n left to saimai lou. n it's like heaven n hell comparing these 2 rest. once i got a table in saimai lou, within seconds someone came to take order. within 15min, my food served! apparently found out the dimsum place was moved from desa sri hartamas to ss2. may b lousy cust svc over there n couldnt survive, so move here to try. i can bet if they nvr learn fr mistakes, giv them 3 months time, they would b looking another new place to move or balik tongsan liao.